Troll-caught wild salmon is a delicious, healthy and versatile ingredient for home cooking. It is simple to prepare and a delicacy that will impress friends and loved ones. Below are some links to recipes and tips on preparation and cooking courtesy of the B.C. Salmon Marketing Council. • The eyes should appear bright and clear, almost alive! The gills should be reddish and the skin moist and with tightly adhered, shiny scales. • Fresh salmon flesh will give slightly when you press it with a finger, then spring back into shape. 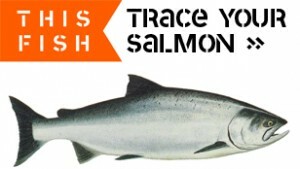 • Fresh salmon never smells fishy, it smells… fresh. • When you get home from the market, unwrap your salmon, wipe it gently with a damp cloth, then tightly wrap in plastic or foil and store in the bottom of your refrigerator. Enjoy it within two days. • Choosing salmon steaks or fillets? Whether they’re fresh or previously frozen, look for moist, translucent – never dried out – flesh. • But the easiest way is to buy canned salmon, good year-round. Fresh caught, sealed in cans, then cooked for perfect flavour and always ready to eat. Storing salmon is easy. Place the fish on a platter or pan with a double layer of paper towel underneath. Put two or three slices of lemon on the top of the fish, then dampen a tea-towel with tap water and lay over top. Wrap the fish and tray with cling-wrap and store on the bottom shelf of the refrigerator. Salmon will store well this way for up to two days. Put some away! Well-wrapped salmon will freeze for up to two months in a refrigerator and three to four months in a deep-freeze. Using lined freezer paper, wrap tightly with at least two layers of paper from head to tail. To thaw slowly, unwrap, place in pan and cover, and leave for 24 hours in the refrigerator. To thaw faster, place the whole fish in a sink with cool running water allowing about one hour per pound. Even faster: use the defrost cycle of your microwave allowing 2 to 5 minutes per pound with equal standing time in between zaps. For all conventional methods, measure salmon at its thickest point, including stuffing if used. For each inch (2.5 cm) thickness, cook at high heat: 10 minutes if fresh or fully thawed; 12-15 minutes if partially thawed; 20 minutes if solidly frozen. Add 5 minutes to total cooking time if salmon is foil-wrapped or heavily sauced. The secret to successful salmon cookery is do not overcook! Whichever of the following cooking methods you choose, your salmon will be cooked to perfection when flesh becomes opaque, flakes readily, and is easily pierced with a fork. Place marinated salmon over hot coals on a well-oiled grill or, for especially easy turning, in a well-oiled BBQ basket. Baste frequently with remaining marinade and turn once halfway through cooking period. 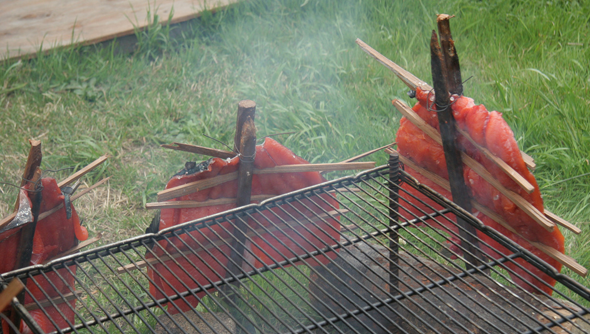 Tip: Almost every cut of wild BC salmon is terrific over the coals. Because salmon is lean compared to other protein foods, it does not exude a lot of self-basting fat. Be sure all grills, baskets, racks, foil, etc. are well-oiled to ensure easy handling of salmon while barbecuing. Marinating and frequent basting will keep salmon moist and flavourful. Coat salmon with seasoned flour or crumbs and fry in a small amount of hot butter or oil, turning once halfway through cooking time. Tip: Try cracker, cornmeal or cornflake crumbs for coating. Add Parmesan cheese to crumbs for extra zest. Cut salmon steaks or fillets into bite-sized pieces. Coat with cornstarch and stir-fry gently and briefly in hot oil before adding to your favourite stir-fried vegetables. Place seasoned and/or marinated salmon on well-greased broiler pan. If using fillets, fold thin ends under to ensure even cooking. Broil under preheated broiler 4-5 inches from heat. Place salmon on a greased perforated rack over 1-2 inches of rapidly boiling water. Cover with a tight-fitting lid and keep water at a constant boil through cooking time. Cover salmon with cold poaching liquid (water, broth, etc.). Bring to a simmer, then cover pan and keep liquid at a simmer for required cooking time. Place salmon in a greased baking dish (or wrap in oiled foil and place on a baking sheet). Brush with melted butter or oil and season with salt and pepper. Bake in a preheated 450 F (230 C) oven. Tip: If stuffing is used, remember to measure salmon after it has been stuffed in order to calculate proper cooking time. This entry was posted on Sunday, January 9th, 2011 at 10:21 pm	and is filed under WILD SALMON and tagged with cooking, recipes, wild salmon. You can follow any responses to this entry through the RSS 2.0 feed.